Great for keeping those pesky Canada Geese away. This realistic, life-sized coyote decoy offers a safe, humane and efficient solution to geese problems at golf courses, city parks, airports, corporate grounds, homes and more. The Flambeau Master Series Lone Howler Coyote Decoy is flocked to emulate a fur-like texture for a realistic appearance. The flocking of this coyote decoy also reduces noise during transport and setup. This Flambeau decoy features a faux fur tail with wire frame that is posable and moves in the wind. In addition, this flocked decoy's bungee leg system allows it to be placed in a sitting or laying position for enhanced versatility. Simply attach a white rag or rabbit pelt to the flocked decoy's snout to attract the attention of other coyotes. This Flambeau decoy was designed by renowned wildlife artist Charlie Norton. Great for helping keep those pesky geese & herons & away. 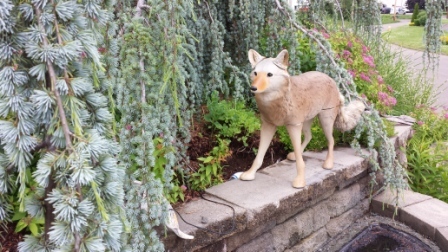 This realistic, life-sized coyote decoy offers a safe, humane and efficient solution to geese problems at golf courses, city parks, corporate grounds, homes and more. This decoy has a realistic furry tail that moves in the breeze and the 3-D feature allows for 360° coverage. Versatile: use on golf courses, city parks, airports, corporate, school or hospital campuses, homes, etc. Great for keeping those pesky geese away. This realistic, life-sized coyote decoy offers a safe, humane and efficient solution to geese problems at golf courses, city parks, corporate grounds, homes and more. This decoy has a realistic furry tail that moves in the breeze and the 3-D feature allows for 360° coverage. Many airports around the world have problems with birds being sucked into the intake of the jet engine scausing potential serious damage to the engine. (Remember the forced landing in the Hudson River on January 15th, 2009). Several test programs are being used to study the effectivness of these coyote decoys to keep the birds away from the runways. So far the decoys appear to be working well with Canada Geese but not with Seagulls or Ducks. At TJB-INC, we have had great sucess with backyard ponds & corporate grass areas with preventing the Canada Geese from foraging on the grass and leaving those nasty piles of poo behind. They will stay in the water but will fly away to feed. Since the geese tend to leave their poo droppings in the same grassy areas they feed on, keep them off your lawn will reduce the poo droppings on your property! Pity the poor property owner who does not have a decoy and gets a hungry flock of Canada Geese. They will have a large mess left behind. Predator hunting and most specifically Coyote Hunting has grown significantly across the United States along with the overall coyote population. The Coyote's scientifc name (Canis Latrans) means "barking dog" while the common name Coyote comes from the "Coyotl" the name used by Mexico's Nahuati Indians. This fast mammal can top out at over 40 mph for short distances and can make 14 foot leaps. Many myths from Native American peoples include a character who plays the role of trickster. While Coyote's often grow up to 26" in shoulder height, this decoy was designed smaller to play on the coyote's natural instinct to defend its territory and rid the area of unwelcome trespassers. The decoy moves the approaching Coyote's attention from you to the decoy --- turning the table on the fabled trickster. Ears can be rotated & posed. Faux fur tail is posable using the wire frame and will move with the wind. Rear legs can be spread (or folded under) to allow decoy to be posed in sitting position. All legs can be folded under to allow decoy to be posed in bedded position. Rear leg designed to accept electronic Lohman® Invisi-Series remote game calls. 1. Do not get human or unnatural scent on the decoy. Use gloves when carrying and positioning the decoy, then spray it with scent eliminator. 2. Place decoys upwind of where you expect the coyote to appear. Coyotes instinctively approach downwind. 3. Place decoys within your personal shooting distance in a clean shooting lane ... SAFETY FIRST! 4. Do not place the decoy in a direct line between you and where you expect the coyote to come from, the coyote may see you. Place the decoy off to one side of your location to distract the coyote's attention from your position. 5. Increase stability in strong wind by facing decoy "nose-first" into the wind. 6. Stake legs to the ground in windy areas by drilling holes in any of the 4 paws. 7. For added effectiveness, add crow & rabbit decoys to create a realistic setting and increase the confidence of approaching coyotes. NOTE: We have noticed that the decoy only works well on adolescent & adult Canada Geese. The young chicks have not been exposed to most predators so they do not know to be afraid. If they are separated from their adult guardians, they will approch Coyote Decoys without any fear (just like a young puppy). 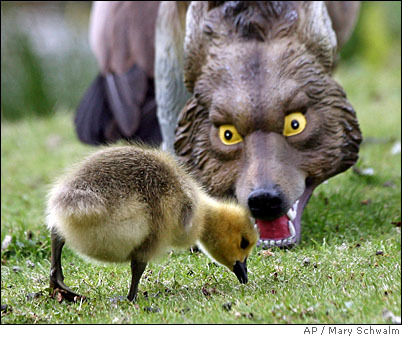 AP photographer Mary Schwalm captured a great photo of a BirdX Coyote decoy and a nearby baby Canada Goose chick that has no fear. Mom on the other hand, was squaking from a far distance away to try to get the chick to turn around and get away! From Ray Skogen of Trophy Club, Texas on 6/19/2014 . So realistic it fools geese and pilots alike! From M. Grenoble &quot;VanillaFace&quot; of Ft. Lauderdale, Florida on 10/6/2013 . From Mary Elaine Ramsey of Topeka, Kansas on 9/22/2013 . From Karin Murdock of Dahlonega, Georgia on 9/6/2013 . From Henry J. Zapasnik of Lincoln, Nebraska on 8/15/2013 . 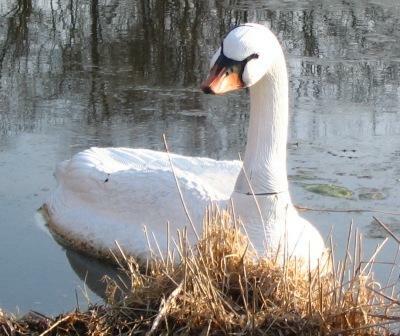 Floating White Swan Decoy for Canada Geese Control in Water Gardens & Ponds – Place one of these in the water to prevent the geese from landing.